J R Controls provides control systems for the automotive industry. 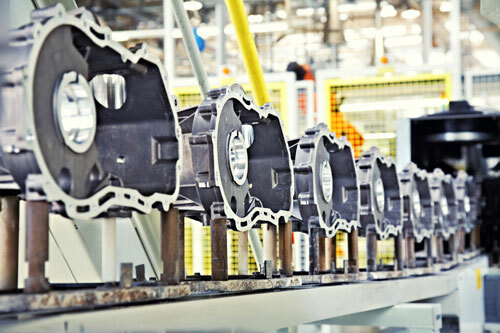 These control systems manage the movement of parts on a timely basis per a production schedule while keeping track of the progress of those parts. Many of these controls systems are Just In Time (JIT) systems where parts are delivered at the exact time they are needed. These control systems need to have high reliability and high uptime while allowing easy maintenance and troubleshooting using standard controls components specified by the customer. Automotive control systems are typically modular in design allowing for easy reconfiguration for future production requirements and changes. These control systems frequently utilize barcoding, RFID, and many specialized devices associated with assembly including torque tools, ovens, electrical testers, tolerance checks, inspection cameras, and robots. Some of these control systems interface with a supervisory MES system while others monitor and maintain part progress internally. These control systems typically have multiple system operator screens (HMI) for system monitoring and trouble shooting.